Investigate the area of a rectangle. Consider why the area of any shape is always described as ______ square units. Investigation: 1. Move the sliders Base and Height and describe what happens to the image. 2. What relationship does the number of squares have with the area of the rectangle? 3. Is there a way to find the number of squares without counting them? 4. 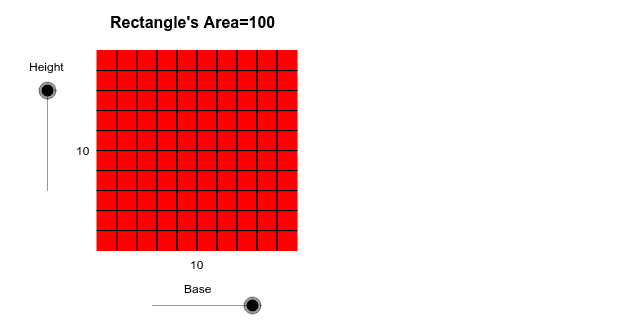 What conjecture can you make about the formula for area of a rectangle? 5. Why do we write area as _____ square units? 6. On your paper, draw a rectangle that is 3.5 centimeters by 5.5 centimeters. What is the rectangle's area?